Most of our products are easily fitted by a keen DIYer, however we offer an excellent while-you-wait fitting service for those less experienced or without the time or tools. Our Fitting Centre is at our depot in Lichfield, Staffordshire, England. Just call us before ordering and we can discuss the cost and when it is convenient to bring your vehicle in. We have a dedicated waiting room with table and chairs, a smart TV with Netflix, fast broadband, tea/coffee, sandwiches, etc, or we can drop you off in Lichfield town centre to have a look at the attractions while we get on with fitting your parts. Some attractions, apart from the shops, are Darwin House, Dr Johnson’s birthplace museum, Lichfield Cathedral, Stowe Pool, Beacon Park. Or we can advise on hotels or drop you off at the station if it is going to be a big job or you have travelled long distance. We also offer a Paint Service. Many thanks for looking after me and more importantly my X-Tech Defender, on my recent visit to fit rear windows and bulkhead reduction bar. Your attention to detail and quality of equipment supplied and fitted is first class, with everything fully explained prior to equipment installation commencing. Nothing was too much trouble, served with tea/coffee and Turkish snack food (very nice). Would recommend your products and fitting service to everyone worldwide. Brian Wilde, Yorkshire, Sept 2016. Hi Ferzan and Sally, just a short note to say many thanks for the great product and great service you provided to me this week. After my daughter and I drove to you from Bedford the cup of tea was very welcome on arrival and after a quick chat about the job (and other Defender related items !!) you even gave us a lift to the station which was most unexpected. When I returned the vehicle was ready before time and the fixed panoramic windows looked stunning in my brand new defender, from the inside and out – I am very very pleased !! Incidentally I had to take the vehicle back to the Land Rover dealer today, and some technicians standing outside having a break said they didn’t realise the panoramic windows were a Land Rover option on the Defenders now – testament as to how good they look and suit the Defender I feel !!!! I will be back for some more bits soon. D Lewis. 2015. Ferzan and Sally, thank you for a level of care and service that must be unique today. Making arrangements months in advance from 8000 miles away, ordering parts to arrive on time and retaining flexibility with good humour and a sincere friendly approach were appreciated, as was your effort to keep us on a tight timeline. Thanks also for helping us with accommodation and transport. Lastly thank you for supplying excellent quality products and for keeping in touch to make certain we felt we had your support during fitting, we regard you as friends. Dez Foster, Feb 2015. 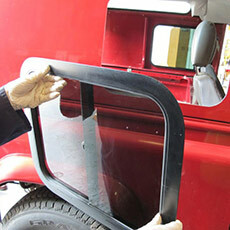 Hi Ferzan & Sally, just like to thank you for a great job in fitting the panoramic windows to my defender Puma 90. Would recommend you to anyone. Thank you for your caring attitude and helpful advice. I will be back for more quality products for the Landy! Your premises to me reflected the work you do; organised, spotless, well presented and impressive. Mark Turner, Jan 2015. Ferzan and Team. Many thanks for your hospitality while fitting blind spot windows to my 90 last Tuesday, and more especially for taking time to explain the options in windows and fitting positions. The new windows are attracting some attention locally, and I am very happy to recommend you – good products, good service and really nice people to deal with. Regards. Bob Parry. Nov 2014. A very friendly and efficient service. Fitted rear and side tinted windows whilst I waited. The product is extremely high quality, and once fitted the irritating rattle of the factory fitted original Landrover windows had gone. Excellent customer service, they accommodated me at the weekend at no extra cost. Very happy indeed. Gareth Roberts July 2013.